In the investigation of a railway construction project, if we use machine made sand in the roadbed, bridge, ridges and culverts, tunnels, houses and other projects instead of using natural river sand, it will cost 5 million cubic meters of them and save nearly 700 million yuan compared with the use of natural river sand. This shows that the application of machine made sand in railway construction has great potential. 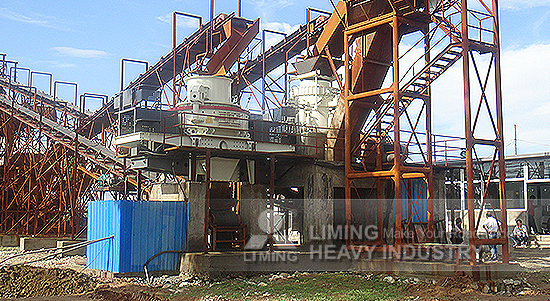 Liming Heavy Industry specializes in the production of sand-making equipment to provide customers with efficient products. VSI6X vertical shaft impact crusher adopts four-openings impeller design structure and special sealing structure to prevent oil leakage of bearing cylinder. Compared with the previous equipment, the crushing efficiency is increased by about 20% when processing the same material, and the service life of impeller is increased by about 30-200%. At present, the overall technology and grinding technology of the product are recognized as international advanced level. 5X series sand making machine is a product widely used in the market. There are production sites in Russia, Jamaica, Chile for inspection. The equipment has the characteristics of high material throughput, long service life, short maintenance time and low wear rate, and has strong durability and practicability. VU aggregate optimization system integrates sand making, stone shape optimization, stone powder control, gradation adjustment, water content control and environmental protection treatment together. It is a dry type sand making equipment with strong environmental protection. It adopts tower type fully enclosed layout, and the dust does not spill over. Liming Heavy Industry not only supplies quality sand making machine, but also provides systematic solutions covering design, procurement, construction and trial operation. At present, this EPC project is progressing steadily, and good feedback has been obtained in Lhasa, Hubei, Anhui and other places.